Grange farm developed alongside the site of Grange Mill. The farmhouse, workers cottages and barn were arranged around a courtyard which lay to the west of Moor Road, and northwest of the Papplewick Grange. 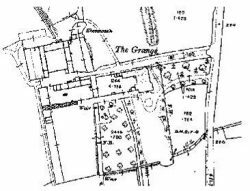 This Map, an extract from the OS 25″ (sheet 33.5) shows Papplewick Grange in 1915. The track north of the house links Grange Farm to Moor Road. 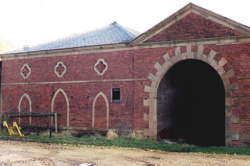 The 19th century buildings were cleared in the 1960s and replaced by modern barns and stores. In 2016, the whole of the farm site was demolished and now forms part of a large housing development. This view, looking along the track from Moor Road, shows the eastern facade of the buildings. To the right, behind the railings, is the site of Grange mill. The farmhouse has since demolished. This picture was taken in 2000. It shows the western facade of the remaining old buildings on the Grange site. These decorative architectural details were probably either recovered from the Grange mill buildings when they were demolished in the 1850s, or they are original features dating from the 1780s when the site was first developed a s part of a cotting spinning complex. The barn has since been converted for use as a house.